Being from Vermont I never knew just how beautiful Upstate New York was, and being able to shoot some Indian Wedding Photography in Upstate New York is even better! Check out this eye catching shot of Ruby (Indian Bride). 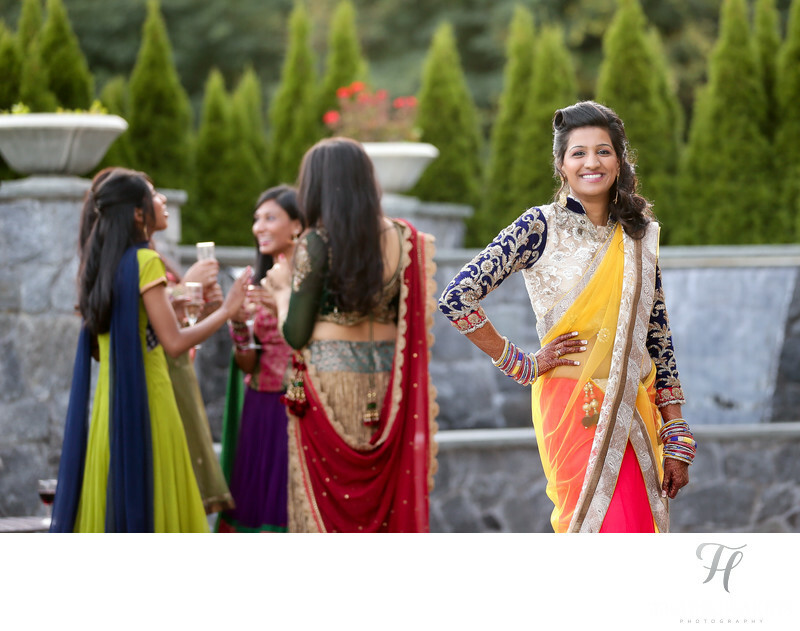 This was taken at one of the events during the five day Indian Wedding that I shot in Upstate New York. The lighting here was just perfect! I did not ad any artificial light of any kind to this capture, and in fact is one of the few shots on my portfolio where this is the case. This was truly a time when everything was "just perfect" on the front of lighting. If you look close, you will notice a nice back light (rim light) and this was created from the sun, yet it was very soft and diffused because of the cloud coverage that day. The main light was also very soft, and very large (wrapping) and this was created from a near by wall that was HUGE just behind me and slightly to the left. This basically acted like a giant reflector and lifted any and all shadows. Somehow this all just "worked" and I was very happy. Then, it just came down to how I wanted to compose this shot. I decided to shoot a picture of Ruby and use the other girls as part of this idea. I positioned them first in the back in a little circle, and told them to just talk and laugh (as they were already doing, but not like this, in this location). Then I positioned Ruby for the shot you see here. This creates what I call a "layered" shot and looks beautiful. Location: Up State New York.